How can CI tools help here? 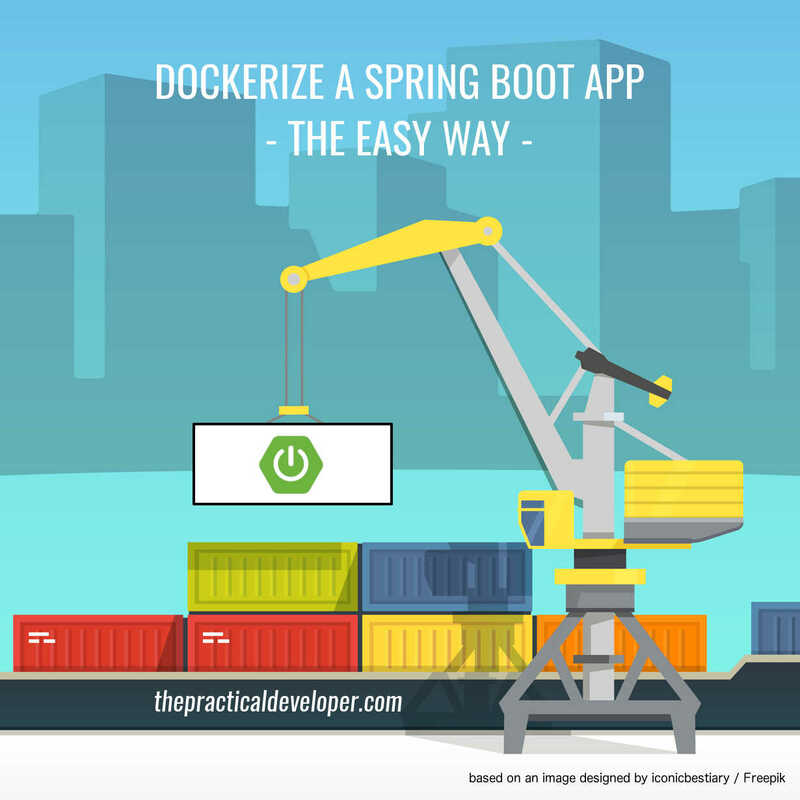 In this post, we’ll use Docker to create an image of a Spring Boot application and run it in a container. We’ll start with a single Dockerfile, then we’ll also cover how to scale our application using Docker Compose and we’ll see how to build our Java code using Docker. Updated: Code examples use Java 10 and Spring Boot 2. More info. 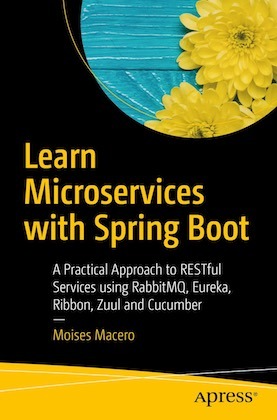 The application we’ll employ through this post is pretty simple: a Spring Boot Web application with a REST controller giving us a warm Spanish greeting. Apart from the ‘Hola’, we’ll show from which IP address the greeting is coming from. That will be useful for us to see how Docker works. 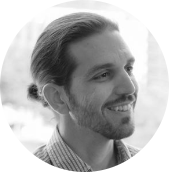 All the code in this post is available on GitHub: Hola Docker Spring Boot. If you find it useful, please give it a star! I’ll guide you through this post as if you were creating the application from scratch, but you can also clone the existing repository and play with it. Since there is no specified path, that text is returned when we perform a GET request to the root context. Let’s give it a try. You used your machine to build the application (using Maven, either previously installed or the wrapper). You used your machine to run the application (either using the spring-boot plugin or the jar file). Let’s start playing with Docker. If you haven’t done it yet, you need to install Docker in one of its versions (Windows, Mac, Linux). If you use an old Windows or Mac system, you’ll need to use the Docker Toolbox. In that case, please note that when I refer to localhost, you should replace it with the IP of your VM (in which Docker runs). Use a Dockerfile to define an image, then build it and run it with plain Docker commands. Use a docker-compose.yml and its command line interface to extend the functionalities when running multiple containers, and simplify it by having a predefined configuration. Use docker to build our java code as well (note that this is more an experiment than a real-life case). The minimal requirement we have to run our Spring Boot app in a container is to create a file named Dockerfile with instructions to build the image. Then we’ll run a Docker container using that image. As you see, I kept it really simple. The image is based on a slim Linux with JRE 10; on top of that we copy the JAR file, we change to the working directory in which that package is, and we execute the same command as we did before when running from our machine. The EXPOSE instruction is telling Docker that the 8080 port can be exposed outside the container, but note that we’ll also need to make the port available when running it anyways. If you want further details about what every line does, I recommend you to have a look at the Dockerfile reference documentation. If you use Java 8 instead, you can benefit from an even smaller Linux image (alpine). Unfortunately, the alpine distribution is not yet compatible with Java 10 at the time of writing this post. We build the image so it’ll be available in our local Docker registry. We give it a name with the -t flag, and specify the current directory as the one in which the Dockerfile lives. docker build -t hola-manual-build . Note that the IP is different from the previous one since now the application is deployed inside a Docker container. Each container will get a new assigned IP inside the Docker’s network. You built the image using docker build. You ran the container using docker run, specifying the port to make it available from the host. Docker Compose is a tool to run multiple containers, define how they are connected, how many instances should be deployed, etc. It allows you to define how the image should be built as well. Let’s use it in our scenario to simplify the way we run the container. We create only one service: hola. We define how it’s built: using the same folder as a context, since there is the Dockerfile and the different files located. We don’t need to specify the dockerfile parameter, but we’ll introduce it here since we plan to modify it later. We give a name to the image so, if it’s not present, the compose tool will build it and assign that name to the resulting image. If it’s there, it won’t build the image again unless we instruct it to do so (we’ll see how later). WARNING: Image for service hola was built because it did not already exist. To rebuild this image you must use `docker-compose build` or `docker-compose up --build`. So now we know that the host port is 32768 (it may vary in your case). We navigate to localhost:32768 to have our greeting, again coming from a container. Subsequent executions of docker-compose up won’t require building the image. docker-compose build, which will build all the services but not run them. docker-compose up --build, which will build all the services and then run them. You used docker-compose to build and run the application. You can see how easy is to have multiple instances of our containers up and running. You can also override the number of instances from the command line, by running docker-compose up --scale holaweb=[number_of_instances]. If you’re experienced with topics such as service discovery and routing, you must be visualizing now what are the possibilities that docker brings. We could include in this scenario a service registry and an API gateway and benefit from load balancing without too much effort. I’ll try to cover that in a different post. This is a more advanced scenario in which we use a docker container to build the application and also to run it. Don’t do this unless you have a good reason; most of the modern Continuous Integration tools use Docker themselves to create dynamic containers to build the application packages, run the tests, etc. You want to build locally but you’re working on a machine that doesn’t fit the requirements to build the application. For example, you need linux / mac tools but you’re running on windows. Your application requires a complex setup to be built so it’s convenient to have a pre-cooked docker image with all the required packages and configuration that you can run anywhere. However, note that for the scenario shown here it’s easier to build the code as we’ve been doing until now, just using java and maven on our machine while building the application and then docker to run it. Anyway, we’ll use it as a reference so you can get the idea and apply it (if needed) to other cases. Instead of using a JRE as the base image, we’re using one with Maven on it. That one is a layer on top of the Java image, so both tools will be available. The first part of the Dockerfile is copying the java code to a folder in a container and running mvn package. Remember that this step will be executed while building the image and, as a result, the jar file will be committed to that image layer inside a new target folder, as expected when we run that maven command. The second part of the Dockerfile is similar to the one presented above. The only difference is that now we’re not taking the jar file from the host’s context, but using it from the previous image step. Since we’re now copying all the contents of the directory to the docker image, it makes sense to create a .dockerignore file to avoid copying things we don’t need there (see the repository for an example). We’ll see how the build process is packaging the java application, downloading all required dependencies and running the tests. The subsequent steps to build the image are taking the resulting .jar file and copying to a different folder. As you might expect, we can now run the container with the same result as before, using docker-compose up. You used docker to build the application (so you don’t need to have Maven nor Java installed on your machine). That could be seen as an advantage but remember my previous comments: that scenario has just a few real-life applications. It’s the expected result since now our image has more layers and also includes the source code in it. Even though this is a working experiment, there are only a few real-life scenarios in which building your Java application with Docker by yourself might be useful. If you don’t need a complex setup on your machine to build the application, you can rely on tools like Jenkins Pipelines, CircleCI, GitLab, etc. These tools already build your apps in Docker containers out-of-the-box, so you just need to configure them properly and use their pipeline definition language to specify how to build your code – in this case, using maven. In this post, we went through different steps to see how we can containerize a Java Spring Boot application using Docker. First, we created a simple Dockerfile and we built the image and run it inside a container using plain docker commands. After that, we introduced docker-compose and saw how it can help to simplify the setup and execution. This would be even more visible when multiple services coexist. We also covered how to easily scale up our service. Last, we had a look at the possibility of building the application using Docker too and reviewed the reasoning for doing that. I hope you found the guide useful. Use a comment or the Facebook page to give me some feedback! Que2) I revert above change in docker-compose.yml and run docker-compose up. Application is getting UP but not running in container. Take into account that, when you scale up the instances, they will take randomly-assigned ports to expose outside. In the Testing section, you’ll find how to list the instances to find the ports and then connect. I hope this helps. Hi, I’m new in Docker world and found your presentation very clear and useful. Hi, i’m still new to docker and containerisation. I don’t understand why building in the docker container would be such a bad thing. isnt the entire purpose to abstract the environment so you can focus on code. In my opinion, by putting the build stage in the docker, it removes an extra step where errors might occur due to lib mismatch, for instance java versions or whatever. the docker build will always produce the same thing, be it production or dev env. It isn’t a bad thing, it makes sense in some situations as I tried to explain in the blog post. But if you keep your projects simple and use tools like Maven or Gradle, you shouldn’t need Docker to build your app on your development machine. In those cases, that responsibility is better placed directly at the CI/CD tool side (say Jenkins, Travis, etc. ).